The ProForm SMART Pro 5000 Treadmill is ON SALE! 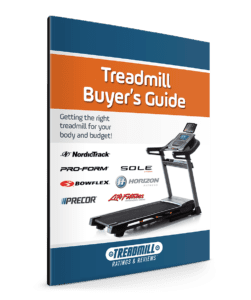 ProForm and its sister company NordicTrack offer some of the most innovative treadmills on the market. We’ve been to their headquarters on a number of occasions and it is obvious that innovative technology is what gives these companies a leading edge. They invest considerable resources in designing interactive technology that both entertains and motivates. MID-WEEK SALE ENDS THURSDAY: The Proform SMART PRO 5000 its reduced to $1,599 with Free Shipping and a 30-Day Money Back Guarantee. No Interest Financing is Available. You may have noticed that this new version of the PRO 5000 was released in the Spring 2018. Mechanically, this newer “SMART” model is very similar to the older model. The motor has been tweaked to be a bit more sturdy and long lasting. The main improvement comes in the console technology. The SMART Pro 5000 console is designed to optimize iFit workouts. This includes a faster and more responsive touchscreen, 1 year of iFit membership included in the cost, HD quality graphics, and the inclusion of Live Workouts. Overall, it’s a great improvement in features for a very minimal price increase. This machine is only about $200 more (at the time of this posting) than the older model. 4.0 Continuous Duty HP Motor — This is a commercial pro motor that is designed to withstand the abuse of runners. It comes with a lifetime guarantee, which suggests it is typically trouble free. 15% Incline and -3% Decline — This machine has a nice range of incline and decline to allow you to simulate running up and down hills. It lets you target additional lower body muscles. Space Saver Folding – This machine folds up for space saving in your home when not in use. This is also handy for when you want to clean around the machine. 22″ x 60″ Running Surface — This is a spacious running surface and the largest you will find on most machines. It will work well for taller individuals. iFit Ready— iFit Live is an innovative technology that allows you to run simulated routes through exciting locations. You can either download routes from Google Maps or create your own custom paths. The treadmill will incline to mimic the actual terrain. Manage your account online to track your progress towards your goals. The only downside is that this program requires a paid monthly subscription. Some of the competitors offer similar programs for free. Your first year of iFit membership is included in the cost of your initial purchase. CoolAire Fan – The ProForm SMART PRO 5000 has one large 8″ fan that does a nice job of keeping you cool during your workout. 38 Installed Workout Programs — If you don’t want to spend the money for iFit Live, the ProForm SMART Pro 5000 treadmill has a generous selection of workout programs designed by certified personal trainers. They let you choose from high intensity, speed, incline or calorie-burn workout routines. Warranty — The ProForm SMART Pro 5000 comes with a lifetime frame and motor, 5 year parts, and 2 year labor. Speaker System with iPod/MP3 Player — You get two 2″ high-excursion drivers (speakers) that have impressive sound clarity considering they are built into a treadmill console. You can plug in your iPod or MP3 player and rock out as you burn off those calories. 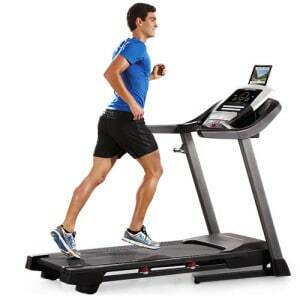 Check out our complete comparison chart of ProForm treadmills here. 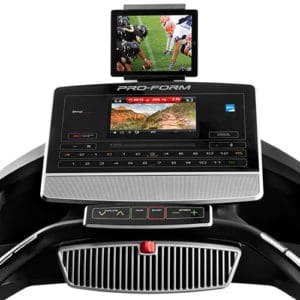 ProForm PRO 9000 treadmill with a 10″ Smart HD Touchscreen display. – Read the full review here. Many of our ProForm and NordicTrack reviews can become repetitive because many of the machines have similar components and features. The overall theme is that these brands usually offer some of the best value for your money. When comparing this model to the ProForm PRO 2000 model, you will be paying about $200 more mostly for the iFit Enabled feature, stronger motor, 7″ Smart HD Touchscreen, and two more workout program options. You can decide if these items are worth the money. Another option would be to spend about $500 more and purchase the ProForm PRO 9000 model. With this machine, you’d be getting a 10″ Smart HD Touchscreen with most of the rest of the specs being the same (see photo on right).